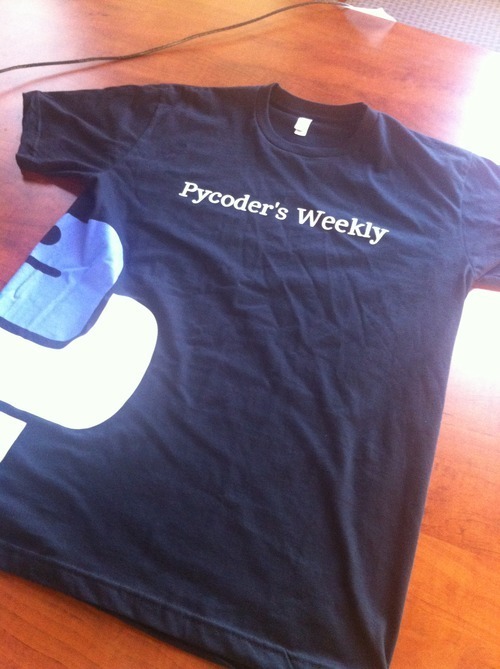 This is a guest post written by Walker Williams, Co-founder of Teespring & purveyor of t-shirt magic. 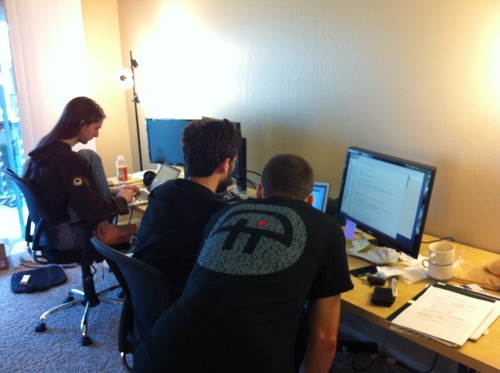 Just over nine months ago, armed with a few beta users and a short wait list, we launched Teespring to the world. The concept was simple: Kickstarter for custom t-shirts. Instead of dropping thousands of dollars to get your tees screen printed and trying to figure out how to get them to your buyers, all you had to do was come to Teespring, design your tee, set a goal (the higher the goal, the cheaper the price per tee), and launch the campaign. Buyers could come to your campaign and pre-order your tee, and once you reached your goal we’d handle the production and fulfillment and send you a check for the profit. We had big dreams of Techcrunch articles and explosive growth. We’d poured ourselves into this, people were sure to be blown away and it wouldn’t be long before they’d be sharing it with their friends. It was only a matter of time. The reality was far less exciting. No one was interested in covering our launch, only a small percentage of the waiting list opened their invite email, and traffic was the same as it had been the day before. It was time to face the truth: There would be no overnight success for us, we’d have to grind it out. During our senior year, Brown’s legendary dive bar (The Fish Company) was shut down following underage drinking violations. Notoriously easy to get into (I once saw someone get in with a Pokémon card for ID), it had been the bar of choice for crazy nights as long as anyone could remember. The whole campus was talking about it, on Facebook, Twitter and in the Brown Daily Herald. Seeing the explosion of interest, Evan Stites-Clayton (my soon-to-be co-founder) and I decided to see if there was anything we could do to harness some of that momentum (and hopefully make a little money while we were at it). T-shirts seemed like an easy option, so we gave our local screen printer a call to figure out the logistics. 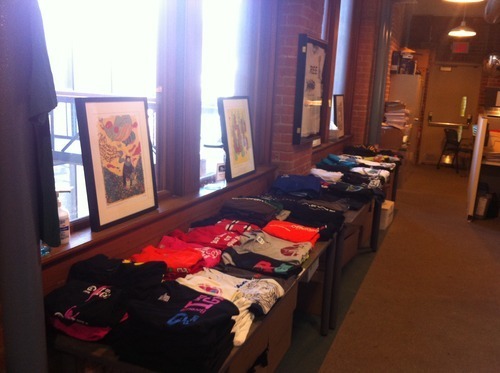 It quickly became apparent that selling t-shirts, and merchandise in general, isn’t as easy as it seems. In order to print t-shirts we’d need to know exactly how many tees (and what sizes) we’d need beforehand, we’d need to front thousands of dollars to get them printed and it would be a couple weeks before we had the tees in hand to sell. None of those conditions worked for us. We had no money, no idea how many t-shirts were going to sell, and in two weeks the buzz would have long since died. We looked at services like CafePress and Spreadshirt, but they used digital printing – a technique that avoided the setup costs of screen printing, but actually ends up being higher cost (and lower quality) at anything above 10-15 shirts. A tee we were quoted $7 on started at $20 on CafePress. Frustrated with the lack of options, we decided to build something ourselves. 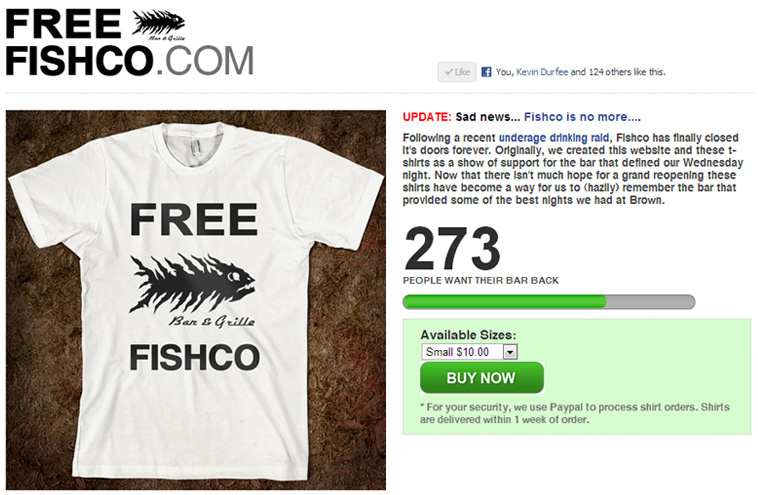 We started coding at 5pm and by 11pm we pushed freefishco.com live (it’s still up if you want to check it out). The premise was pretty basic: If we could get 200 people to pre-order the t-shirt, we’d have them printed and individually ship them to buyers. If we couldn’t reach that goal of 200, no one would be charged and that would be that. We ended up breaking our goal in less than 24 hours and walking away with over $1,000 of profit. More interesting than the money, however, was the number of emails we received from groups, clubs and causes who wanted something similar for their t-shirt idea. That was the point at which we knew there might be a bigger opportunity lurking. The first thing we did was talk to as many people as we could. Evan and I had worked together previously on a project that we’d built to solve a bunch of problems that it turned out nobody actually had, and we didn’t want to repeat that mistake. We talked to charities, fraternities, random people with awesome tee ideas – anyone who’d reply to an email or pick-up the phone. We talked to screen printers, fulfillment houses and shipping providers. We also picked up an important partner, Bill Cesare. Bill was a local angel investor who had been an advisor to us on previous projects. Bill wrote us our first check (which allowed us to drop our side jobs and focus on Teespring full-time), but more importantly he joined the team to head up our operations and logistics. If I had to pick a moment in our history that had the most impact in terms of getting us where we are today, Bill joining the team would be it. Development took about twice as long as we had initially hoped (as it always seems to). We got particularly held up on the t-shirt designer tool – which we rebuilt from scratch a grand total of three times before arriving at the iteration we launched with. During that delay period we were talking with potential customers, such as non-profits and online communities, and launching as many beta campaigns as we could. Right away we could see that it wasn’t as easy to sign up new customers as we’d hoped, especially without a design tool. While people seemed sold on the concept, nobody wanted to take the time to create their own design or launch their campaign. We ended up providing hours and hours of design consultations to groups that would only sell ~50 t-shirts, it was hugely unprofitable and there wasn’t a chance it would scale – but it created happy customers and that was what we needed. 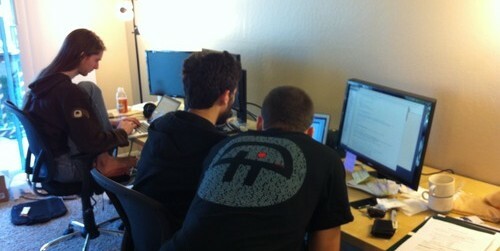 One of the early breaks we got was from two members of the programming community, substack and pkrumins. They launched a series of awesome tees based off of substack’s art including teespring.com/nodejs,teespring.com/oaklandjs and teespring.com/hjkl (which pkrumins created for an article he wrote on the history of vim keys) which not only sold well but also connected us to the hacker community – which has been a huge source of referrals, connections and feedback for us. HJKL introduced Teespring to veb (the author of “How I made money with Teespring”), who then introduced Teespring to the good folks at TWiT – who now hold the record for the most items sold in one campaign with 2,677 tees on www.teespring.com/twit. One thing we noticed after we launched was that very few people were using our product organically. We had a hand in almost everything that was on the site, whether we had contacted the person directly, created their design for them, written the description, etc. It was a scary realization, because it went against one of our fundamental growth assumptions: If we introduced people to Teespring as the backers of campaigns, there was a chance they would come back as campaign organizers in the future. It also cast a dim outlook on our future. Why weren’t buyers converting? How many leads could we continue to reach out to before the sources dried up? Had we built something no one actually needed after all? 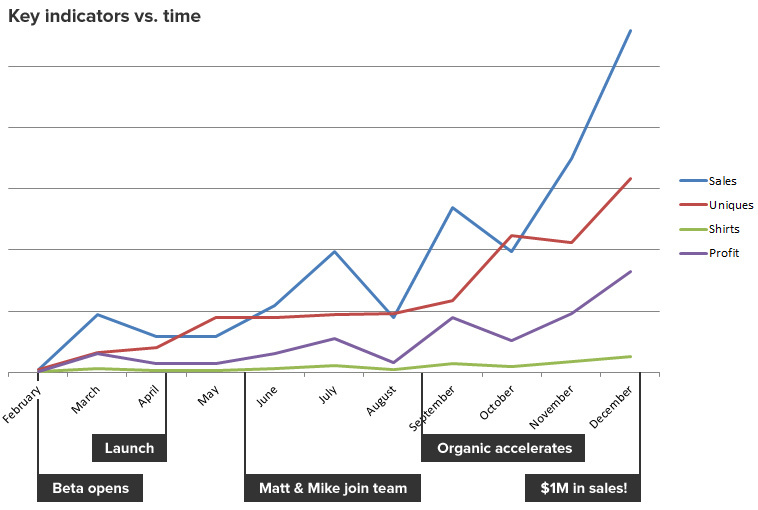 For three or four months we managed to grow slowly, usually taking one step back for every two we struggled forward (and I have to give every ounce of credit for that early growth to Matt Hayes and Mike Cesare – and later Sean Peninno – our scrappy marketing team). And then, after a dismal August, something changed. I don’t have a great explanation for it, it’s as though we had been pushing a boulder up a hill and the slope was finally easing off. Perhaps we’d reached a tipping point in traffic, perhaps it was all those emails and cold calls finally paying off, or perhaps it was just blind luck. Campaigns started popping up organically and selling hundreds of t-shirts, TWiT launched their first campaign and sold almost 3,000 tees, we finally got that article in Techcrunch, we flew past $1M in sales with over $250k in December and, above all, we’re finally profitable. There’s still a long way to go, but it feels like the top is finally in sight and, hopefully, there’s a downhill waiting for us on the other side. From the day we launched we always said we wanted Apple quality with Amazon’s customer experience. It’s something that’s core to us. I’ll always remember ordering a Bluetooth Headset from Amazon that was marked as delivered but was nowhere to be found. I contacted Amazon not expecting more than a “sorry” and phone number where I could call UPS – but to my amazement they offered me a full refund or replacement. A problem that was by no stretch of the imagination their fault, and yet they were going to make it right. From that point on I’ve always been loyal to Amazon, whether I need office furniture or new hardware – I’ll always go to Amazon first. Those are the types of relationships we wanted to build. One of the things that has surprised me most is that there hasn’t been a huge shift in the way I feel about most aspects of the business since we were a quarter the size. There are still days where problems seem unsolvable and it feels like we’re teetering on the edge of failure (and maybe we are – who knows). Profitability always seemed like this imaginary finish line, the place at which we could maybe take a deep breath and relax a little, but now that we’ve made it, it’s been replaced by a never ending quest for growth. Even during our best months, a part of me can’t help but feel terrified at the fact that next month the race is going to start all over and we’ll have to not only reach that same level, but exceed it (and, if you want to keep those investors excited, exceed it by 40%). Entrepreneurship is a game of extreme highs and devastating lows, and it’s been important to our sanity to try to celebrate our victories and keep the bigger picture in mind. Cake is our weapon reward of choice, and it’s been super effective. Walker Williams has been working on startups both as a founder and on the programming/ux side of things for the past 7 years, graduated from Brown University in 2011 and founded Teespring a couple months later. Want to get in touch? Shoot me an email at walker@teespring.com. This article has been republished from its original source with the permission of it’s author, Walker Williams. very interesting read – thanks for sharing. Teespring is a great idea and good people. I see this only benefiting the industry for the better. As a business owner who has seen the ups and downs in the apparel industry first hand, I believe this will be a good change of pace. Our company Kaules Screen Works specializes in creating custom printed apparel for tech companies and large corporations.